Maddie Shaw went 2 for 3 with 3 RBI inculding a 2 run home run in a 12-2 vicotry over St. Bonaventure on April 19. 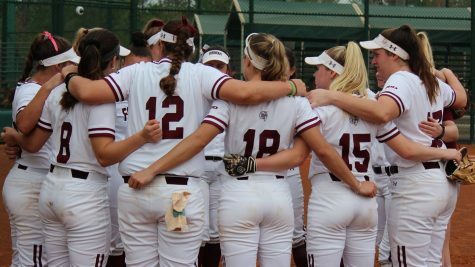 With highs expected in the 80s next weekend, New York is finally getting some warm weather, and the Rams’ softball squad has responded in kind with a hot streak, going 4-1 last week to move their season mark to 36-13 (12-5 in conference). 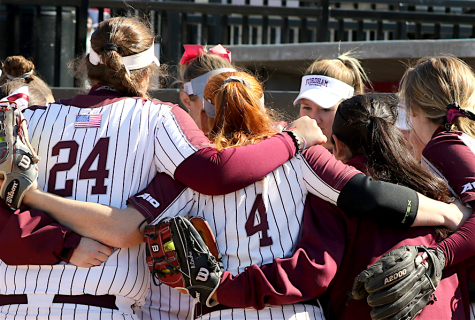 Head coach Bridget Orchard’s team came off a rough road trip to top-of-the-A-10 UMass to. 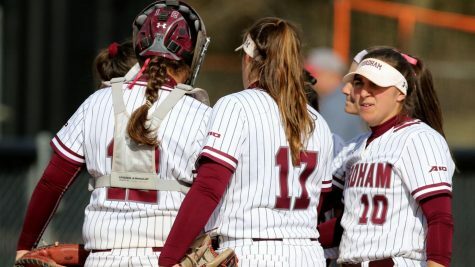 This all comes despite a rash of injuries that has afflicted Fordham’s roster, including the loss of starting shortstop Amy Van Hoven, who broke her leg a couple of weeks ago. 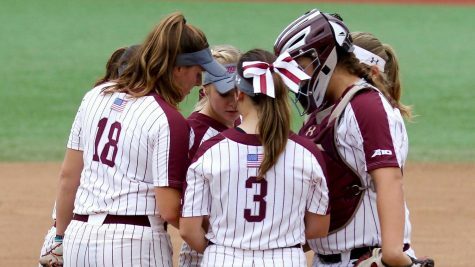 After losing two of three against conference leaders UMass on April 15 and 16, the Rams got back on track against St. Bonaventure on WednesDay, ending both games of a doubleheader early via the runs rule. 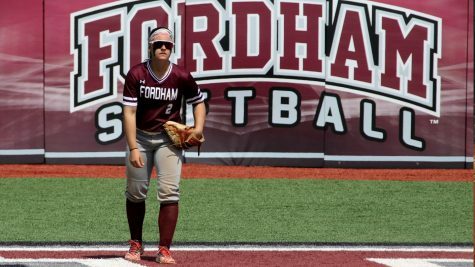 Fordham’s offense exploded in game one, as they scored 10 runs in the sixth inning en route to a 23-8 win. The Rams got on the board first, scoring two runs in the first and second innings to take a 4-0 lead, but the Bonnies came right back to go in front by scoring six in the bottom of the second. The Rams responded by scoring four runs in the top of the third, including one from a Madison Shaw home run, to take an 8-4 lead. The Rams would go on to score five in the fourth, when Sydney Canessa, who finished the game 6-6, with 8 RBIs and scored four runs, blasting a grand slam to left. The Rams would bring the runs rule into effect in the sixth, when they batted around and scored 10 runs, the most they have scored in an inning this season. Lauren Quense got the win after throwing five innings. None of the runs that she allowed were earned. Game two of the doubleheader followed a similar script, although this time it was the Bonnies who struck first, scoring a run on a throwing error in the first. 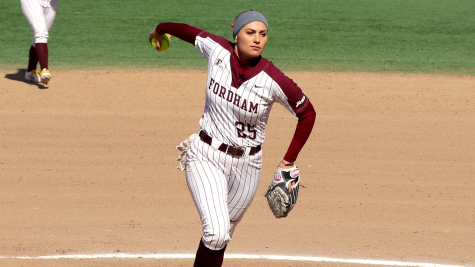 But that did not bother Fordham starter Madison Auginbaugh, who quickly settled in and did not allow another run until the sixth. 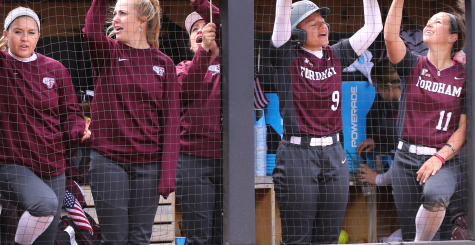 Auginbaugh also helped herself out at the plate, singling in the second to drive in the Rams’ first run, and Fordham took the lead in the third when Maddy Shaw hit a two-run shot to make it a 3-1 game. But the Rams were not done, and Jordy Storm followed a couple batters later with an RBI double to drive in Chelsea Skrepenak. Ally Vergona followed with a single that brought Storm home, Canessa hit a sac fly and Jess Hughes smacked an RBI double. In the end, it was a six run inning for the Rams, as they took a 7-1 lead. The Rams got another one in the fourth when Shaw hit her second homer of the game and third of the day, a solo shot to right. Fordham would finally put the game away in the sixth, scoring four runs. Auginbaugh took a 12-1 lead into the bottom of the inning and the Rams held onto their 10-run lead and took home another victory. 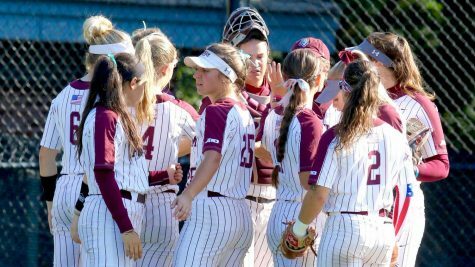 Fordham faced another conference opponent over the weekend, as George Washington came to the Bronx for a series. Lauren Quense was in the circle for the Rams, leading them to an 8-3 victory. Quense actually fell behind early, allowing three runs in the first two innings before she settled down. 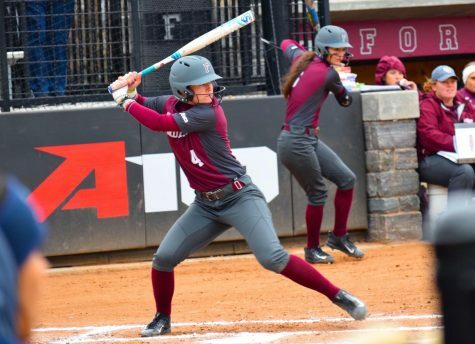 The Fordham offense got off to a slow start as well, scoring a run in the first and the third, but they really got going in the fourth, when Skylar Johnston’s two-run single gave the Rams a 4-3 lead. The Rams managed to score three more in the fifth and got another in the sixth off a Sydney Canessa solo home run. In the seventh, Quense came back out to finish the complete game and earn her 17th win of the season. The next day Fordham had a doubleheader against GW, and they lost the first leg 5-1. Auginbaugh was in the circle for the Rams, and she started strong, dueling Colonials’ starter Sarah Costlow for the first few innings. Both started blinking in the third, when Auginbaugh allowed an RBI single and Ally Vergona drove in Fordham’s only run with a sac fly. From that point, Costlow did not allow a run, as she baffled the Rams’ batters with her arsenal of pitches. But Auginbaugh would not be so lucky, as GW got her with an RBI single in the fifth to take the lead, and home runs from the Colonials in the sixth and seventh sealed the Rams’ fate as they were unable to come back. Game two went better for Fordham, as they scored early and often against George Washington’s Faith Webber to win, 12-0, in five. Quense was back on the mound earning her 18th win with four shutdown innings in which she allowed only one run. On the offensive side, the Rams got on the board quickly, scoring four in the first as Skylar Johnston hit an RBI single, Auginbaugh was walked with the bases loaded and Jordy Storm drove in two with a single to right. Three more came home in the second,when Canessa continued her hot hitting with another solo home run and Lindsay Mayer drove a two-run double down the right field line. Johnston would also hit a two-run double in the third, and Skrepenak and Hughes both went deep in the fourth to give the Rams the 10-run margin that they needed. This weekend the Rams play a huge series against Dayton.